Thomas Hughes (1851-1928), of Edenmore, DL, High Sheriff, 1903. JOHN BASIL HUGHES TORRENS (1902-). CAPTAIN FREDERICK MICHAEL ALEXANDER TORRENS-SPENCE DSO DFC AFC RN (1914-2001), of Drumcullan House, near Downpatrick, County Down, High Sheriff of County Armagh, 1979, had a distinguished career in the Royal Navy, Royal Air Force, Ulster Defence Regiment and Ulster Special Constabulary. Captain Torrens-Spence succeeded Sir Norman Stronge as Lord-Lieutenant of County Armagh (1981-89) following Sir Norman's heinous murder with his son James at Tynan Abbey (my father and I attended their funeral at Tynan parish church). BRIGADIER EDWARD JOHN (Johnny) TORRENS-SPENCE CBE. HERBERT FREDERICK, of whom presently. LIEUTENANT-COLONEL HERBERT FREDERICK SPENCE (1880-1937), of Rosstulla, Whiteabbey, County Antrim (see above). 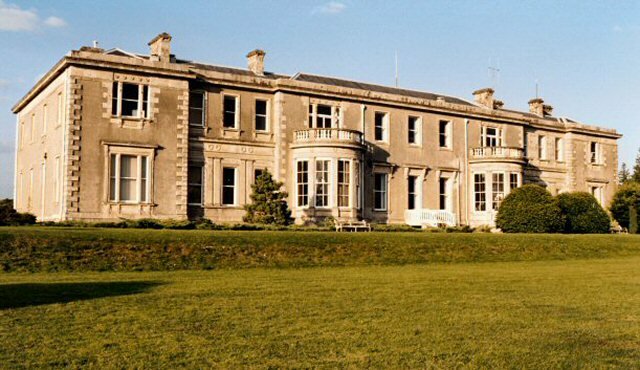 EDENMORE HOUSE, Whiteabbey, County Antrim, was built in the Italianate style ca 1865 for James Torrens (1796-1884), a prosperous solicitor and land agent for the Donegall and Shaftesbury Irish estates. The mansion was likely designed for Mr Torrens by the architects Lanyon, Lynn & Lanyon. There were two gate lodges, long since demolished. It remained the Torrens residence for 63 years years, until the death of James Torrens's son, Thomas Hughes Torrens (1851-1928). Following his decease, Edenmore became the quarters of Edenmore Veterinary Hospital under the patronage of the Ulster Society for the Prevention of Cruelty to Animals. In 1950, the house and demesne were adapted as RAF Edenmore, a base for No. 67 NI Reserve Group and No. 3502 (Ulster) Fighter Control Group. Edenmore opened as a hotel from 1963 until the mid-1980s. Its principal function rooms were named Eden, Torrens and Shaftesbury. Subsequently Edenmore became a care home. It was demolished in 2016 for a housing development. DRUMCULLEN HOUSE, Ballydugan, near Downpatrick, County Down, was a part of the ancient Demesne of Down. Through the Middle Ages the demesne, including the townland of Hollymount, was owned by the Downpatrick Benedictine Abbey. During the Reformation, the land was seized by HENRY VIII and granted to Gerald, Earl of Kildare. The ownership of the land passed through several hands to Lady Cromwell, who married the Rt Hon Edward Southwell MP, Secretary of State for Ireland. In 1695, Lady Cromwell leased Hollymount Townland to General Nicholas Price, of Hollymount. Mrs Mary Delany stayed at Hollymount House in the summer of 1745, sketched the house and wrote a romantic description of it and the surrounding woodlands. From the Prices, the property passed by marriage and inheritance, in 1779, to Francis Savage and then, when he died in 1723, to his widow, the Lady Harriet Butler. Lady Harriet later married Mathew Forde, of Seaforde. Her ladyship greatly enlarged Hollymount House, building a new Georgian-style wing in front of the old house, now ruinous. 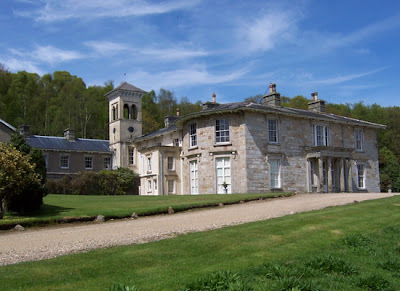 In 1838, Lady Harriet sponsored the construction of Hollymount Church; and in 1841 arranged for the construction of a new house on her estate, Drumcullen, as a residence for the Rector of the new church. In 1853, she enlarged the house after a design by Charles Lanyon for herself and her nephew, the Rev Pierce Butler, Rector of Hollymount, 1852-56. 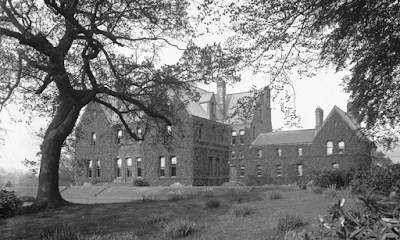 Later residents of Drumcullen House included the Rev F H Hall, William Russell, a solicitor in Downpatrick and Portaferry, the Whitesides and the Galways, from whom Captain Torrens-Spence bought the property ca 1948. The estate comprises 113 acres including the house, garden, farmyard and woodland. 103 acres have been let on a con-acre basis to the same tenants for about 20 years. There are farm buildings, including stables and three Dutch barns (recently re-roofed). The property has recently been sold, following the death in 2017 of Mrs Rachel Torrens-Spence. 9, WELLINGTON PLACE, BELFAST, a red-brick Georgian townhouse of four storeys, was built ca 1830. The premises were purchased outright in 1860 by Richard Davison and James Torrens, who were recorded as occupants in that year. Davison and Torrens were solicitors who established an office at 9, Wellington Place, but also had a branch at 65, Lower Gardiner Street, Dublin. Davison and Torrens continued to operate from their Wellington Place offices until the 1920s. They also conducted business as estate agents and principally administered the estate of the Earl of Shaftesbury. In 1910, Thomas Hughes Torrens was recorded as Lord Shaftesbury's agent. The solicitors continued to operate from the address in 1918; however, by that time the firm had changed its name to Torrens & Bristow, when John Bristow took over as partner from Davison. Mr Torrens still operated as Lord Shaftesbury’s agent at this time. Torrens & Bristow had vacated the building ca 1924. The coronet of an earl is a silver-gilt circlet with eight strawberry leaves alternating with eight silver balls (known as pearls) on raised spikes. 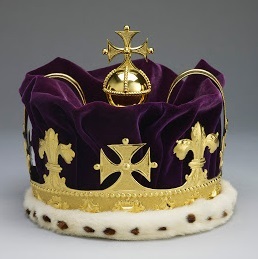 The coronet itself is chased as if in the form of jewels (like a royal crown) but is not actually jewelled. 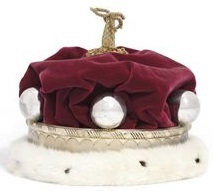 It has a crimson cap (lined ermine) in real life and a purple one in heraldic representation. there is a gold tassel on top. The raised pearls on spikes distinguish it from other coronets. This coronet, which is one of the most striking, has, rising from a golden circlet, eight lofty rays of gold, each of which upon its point supports a small pearl, while between each pair of rays is a conventional leaf, the stalks of these leaves being connected with the rays and with each other so as to form a continuous wreath. The coronet of a countess (below) is smaller in size and sits directly on top of the head, rather than around it. 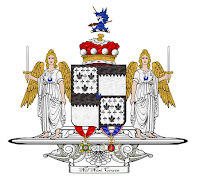 Earls rank in the third degree of the hereditary peerage, being next below a marquess, and next above a viscount. First published in June, 2010. THE TOWNLAND of Ballydugan lies a few miles south-west of Downpatrick, County Down. 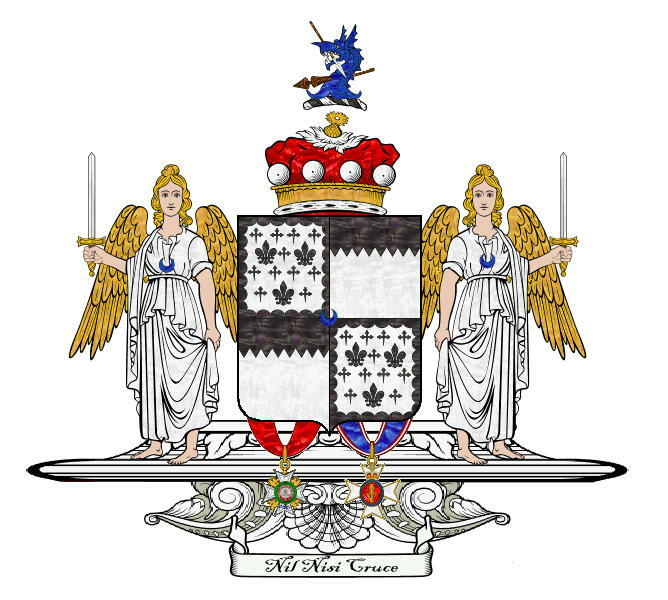 In olden times the county was occasionally referred to as Downshire, and the Hills, Marquesses of Downshire, take their title from this county. The nearest railway station was at Downpatrick, though the line closed down in 1950. Downpatrick Racecourse had a halt which operated on race days only. Ballydugan flour mill, now restored as a guesthouse, was built in 1792. Ballydugan Lake, which stands nearby, was used as a water source for the mill. 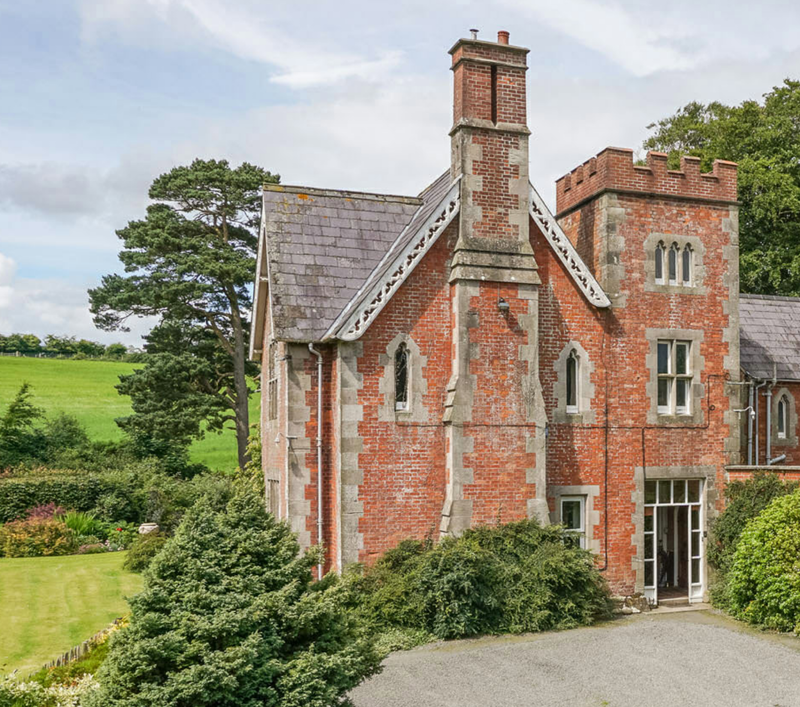 Ballydugan House stands between the Lake and the race-course to the east. Directly beside the lake is the Lakeside Inn. 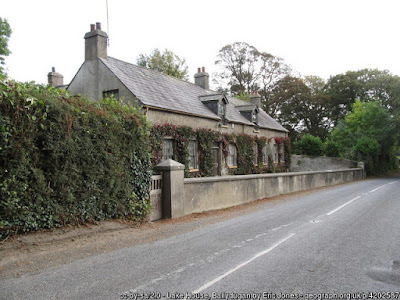 Ballydugan Cottage was associated with the adjacent mill and seems to have been built ca 1830. 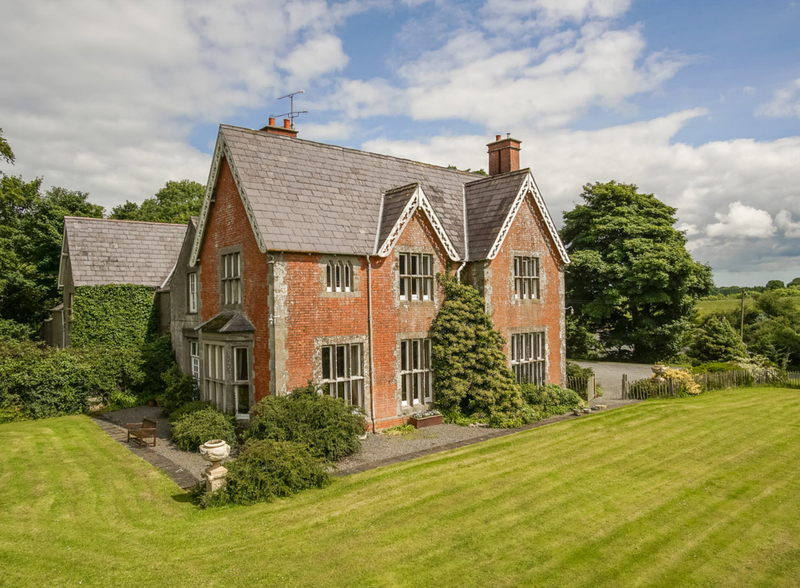 This is a 1 1/2 storey house with dormers comprising three bays, overlooking Ballydugan Lake, on Drumcullan Road. The cottage has a modest garden at the front, bounded to the road by a rendered boundary wall. A sloped garden rises via stone steps to wooded ground at the north. There is a larger garden at the opposite, lake side of the road, a well-maintained, sweeping lawn, bounded by Ballydugan Lake to the west. It truly is a most picturesque landscape, with a fine prospect of the lake and the Mourne Mountains to the west. Isaac Hardy rented the single-storey cottage and the associated mill from William Wallace, Robert Denvir and Sarah Rentoul, though we do not know whether Mr Hardy resided at the cottage. By the mid-19th century, Ballydugan Cottage lay vacant whilst the flour mill, less than 70 years after its construction, had been abandoned. In 1871, the cottage was leased by William Wallace & Partners. Major Charles C Johnston resided at the cottage, then known as ‘Lake Cottage’ during the 1870s. Major Johnston continued to reside at Lake Cottage until 1889, when the Rev Canon Lewis Arthur Pooler acquired it. The cottage was subsequently considerably remodelled ca 1890 with the addition of Victorian features, including its dormer windows. Dr Pooler was a canon of Down Cathedral and also Deputy Master of the County Down Grand Orange Lodge. He continued to reside at Lake Cottage until the end of the 19th century. In 1901 Lake Cottage was occupied by a solicitor called George T Harley, who changed its name to Ballydugan Cottage. Mr Harley was a native of the city of Cork and resided at Ballydugan with his wife, Clara, and their daughter, May. The 1901 census records that there were a number of staff employed to administer the household including a nurse and two domestic servants. Ballydugan Cottage comprised 14 rooms at this time. The Harleys continued to reside at the cottage until 1909, when the property briefly came into the possession of Mr C M Russell, also a solicitor. Mr Russell resided at Ballydugan Cottage with his wife Ann until 1912, when it was bought outright from Colonel the Rt Hon Robert Hugh Wallace CB CBE (1860-1929), of Myra Castle, by one James Kelly. Mr Kelly occupied the cottage during the 1930s; however, he had vacated it by the 1950s, when, about 1956, his relative, Kathleen Kelly, came into possession. I visited the Lake House recently and it appears to be undergoing a complete restoration. The garden in front of the house (beside the lake) has been landscaped and lawn sweeps down to the water. I intend to revisit Ballydugan during the summer, have a small shandy in the Lakeside Inn, and photograph the Lake House and its garden beside the lake. Yesterday I paid a visit to Inch Abbey, Downpatrick and Ballydugan. It is such a long time since I have visited Inch Abbey, that extensive, ruined monastic site on the banks of the river Quoile, just outside Downpatrick, county town of County Down. These visits always fill me with a sense of nostalgia, a taste of former times, picnicking, glorious meadows in the summer. Inch Abbey, by the way, is an idyllic picnic spot, if the weather is clement enough. It was a monastery from about 1180 till 1541, when it was dissolved by HENRY VIII. The graveyard adjacent to the little car-park at Inch Abbey is dominated by the tomb or vault of the Perceval-Maxwells of Finnebrogue. They were the landowners and presented Inch Abbey to the state in 1910. Thence I jumped into the two-seater and made my jolly way in a south-easterly direction, over the river, to the historic town of Downpatrick. Down Cathedral stands proudly to the extreme west of the town, overlooking Inch Abbey across the Quoile. I made a bee-line for Down County Museum, which is located in the historic buildings of the former County Gaol of Down. The Gaol was opened in 1796 until its closure in 1830, when it became a military barracks. I ambled up the hill to the cathedral. The cathedral's graveyard lies directly opposite the west front. The most commanding vault, almost like a little chapel itself, boasts stone pinnacles (larger versions of which adorn the cathedral) and stands at a corner of the graveyard directly overlooking the cathedral's west front. It has an inscription in capital letters, viz. HASTINGS. A black cat was sleeping on a grave further along. Any reader who knows me shall be aware that I never pass a cat without greeting it cordially, and this occasion happened to be no exception. In fact I persevered and at length my feline devotee was roused and befriended me; to the extent that it followed me into a field and up to the threshold of the cathedral. Incidentally, the Perceval-Maxwells, like many other landed families of County Down, were patrons of Down Cathedral. Their armorial bearings are resplendent on large, carved, colourful plaques along the walls of the nave. Thereafter I motored in a south-westerly direction towards the townland of Ballydugan, a truly heavenly spot in the county. Ballydugan is a hop, skip and jump away from Downpatrick; yet you are struck by its tranquillity and "olde worlde" charm. A cursory glance at the map shall indicate that we are within riding-distance of Downpatrick Racecourse. I have already written about Ballydugan House. The old flour mill of Ballydugan is now a guesthouse and undertakes weddings and other functions. It was built in 1792 by one John Auchinleck of Strangford, County Down. Rubble masonry was used in its construction. It is six bays in width and six storeys in height, plus two attic storeys; an impressive, stone-walled forecourt and a gatehouse. A lofty, tapered brick chimney stands behind the mill. A mere thirty or forty yards along the road from the mill stands the Lakeside Inn, a former coaching inn, post-office and spirit grocer's. Margaret Ferguson, whose family owns the inn, has traced the building back to 1840. Margaret has run the inn for seven years, since the death of her mother Meta. Her grandfather, Thomas Hutton, ran it in 1899; and his brother, Bernard, took over till 1890. It came into the family in 1925 when Margaret's grandfather, Thomas Hutton, bought it after 26 years working there. He died in 1959, and his daughter Meta ran it thereafter. Meta Hutton died in 2012 and Margaret with her husband Geoffrey have taken the helm. The two-seater was parked beside the charming little lake at Ballydugan. I strolled along the road on its eastern side and several hundred yards further along The Old Town emerged. It was almost akin to stepping back in time. This is what the Irish call a clachan, a small cluster of buildings huddled together, usually inhabited formerly by extended families and neighbours. A Christian community known as The Old Town Community is based here. Ballydugan Cottages have been turned into holiday accommodation. The Old Town overlooks Ballydugan Lake. A wooden sign nailed to a tree declares that Belfast Anglers Club has the fishing rights. Back at the lakeside car-park, I munched my sandwiches and gave a few crumbs to the sparrows outside. At the north side of the lake stands an old cottage known variously as Lake Cottage, Ballydugan Cottage, and Lake House. Its address is Drumcullan Road. This building and its location interest me, and I intend to write an article about it and its inhabitants soon. 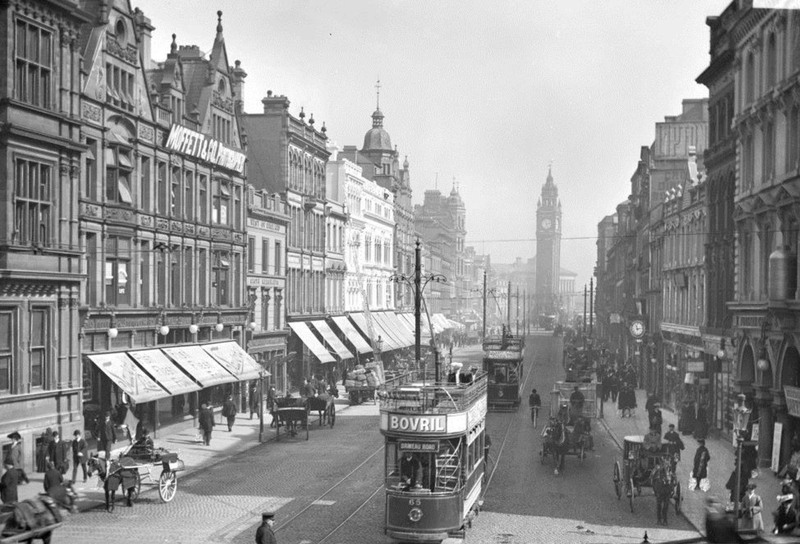 Skipper Street, Belfast, runs from Waring Street to High Street. This is one of the the oldest streets in Belfast, where the River Farset used to flow openly along High Street itself (it still does, though it's culverted). The street was thus named because skippers of sailing vessels lodged here. This street is mentioned as far back as 1685; it was, however, significantly affected by the 1941 blitz. 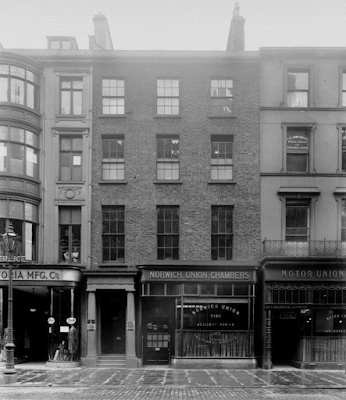 In 1974, The Albert Inn stood at 3 Skipper Street; then it changed its name to the Blackthorn Bar. The buildings are now all relatively recent since many, if not most, were destroyed by bombing during the 2nd World War. The most notable premises today are The Merchant Hotel - formerly the Ulster Bank head office - which now runs along the entire left-hand side of the street (the even numbers). 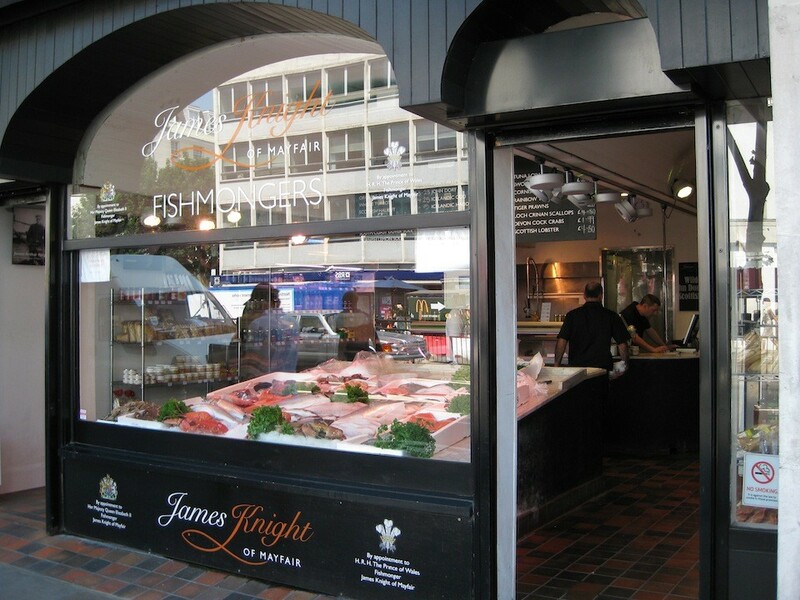 The Spaniard Bar is at number three and Jackson Sports is located at the corner of Skipper Street and High Street. First published in July, 2009. I do enjoy wheaten bread. It's particularly popular here in Ulster, though many wheaten loaves or bannocks sold in the supermarkets don't enthuse me at all. I have been experimenting with various recipes and I think I've found a good one. 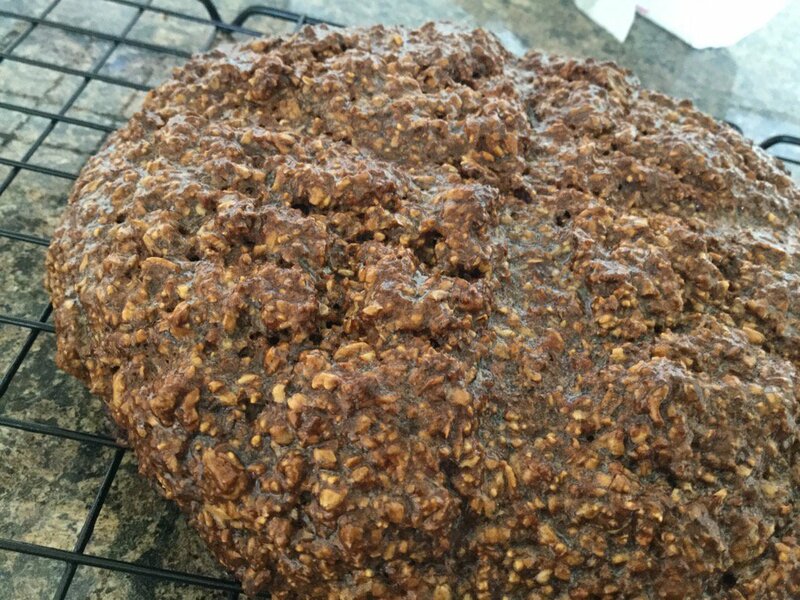 For this recipe I use a greased (buttered) baking-sheet. Measure the dry ingredients in a bowl and mix them. Pour the treacle into the buttermilk and mix in another bowl or dish. Make a well in the centre of the dry ingredients and add the buttermilk and treacle. 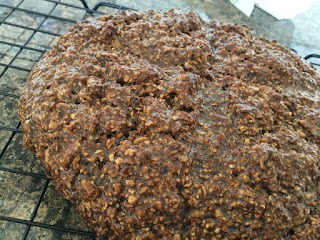 With your hands make the mixture into a round and place carefully on to the baking-sheet. Cut a deep cross on it. Sprinkle the top with wholemeal flour (I often forget to do this). Remove from the oven, brush with melted butter and allow to cool on a cooling-rack. I had the most enjoyable evening last night. An old pal, NCS, picked me up at Belmont GHQ and took me the short distance to that venerable academic institution, Campbell College. There were a couple of stinkers at Campbell during my time, though thankfully they weren't there last night. It was such a glorious evening that some of the former staff and guests were standing in the quadrangle, drinking Pimm's. I leapt out of NCJ's car and joined Keith and a few others. The refreshing glass of Pimm's was duly collected at a side table. A waiter offered delicious little canapés from a large tray. It was truly a pleasure to meet my friend and teacher, Johnny Knox. Johnny - Mr Knox as I knew him when I was a pupil - and his wife chatted with me in the warm sunshine. After a while we all moved in to the Dining Hall. Keith introduced me to the Headmaster, Robert Robinson MBE BSc. I can recall apprising him that my Number was "SIX ONE TWO EIGHT". My name was on a place-card and I sat opposite Keith. Johnny and Mrs Knox sat within roll-throwing distance. This was a formal dinner, of course, and the meal was first-rate. The main course comprised perfectly cooked salmon. I wish I'd taken a few photographs: my camera was in my pocket, though I was enjoying myself so much that I was oblivious to it. Keith very kindly gave me a lift home. The Duke of Edinburgh, Patron, The Duke of Edinburgh's Award, attended Receptions at Hillsborough Castle, County Down, on Thursday, 25th May, 2017, for young people who have achieved the Gold Standard in the Award. His Royal Highness was received by Her Majesty's Lord-Lieutenant of the County Borough of Belfast (Mrs. Fionnuala Jay-O'Boyle CBE). 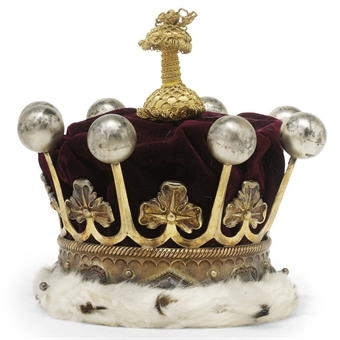 THE coronet of a marquess is a silver-gilt circlet with four strawberry leaves around it, alternating with four silver balls, known as pearls, on points. 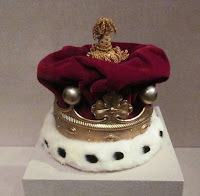 It has a crimson cap (lined ermine) in real life and a purple one in heraldic representation, and a golden tassel on top. The alternation of strawberry leaves and pearls is what distinguishes a marquess's coronet from those of other ranks. Coronets are rarely worn nowadays, although they are customarily worn at coronations. They can, however, still be seen depicted on peers' coats-of-arms as a badge of rank within the five degrees of the hereditary peerage. 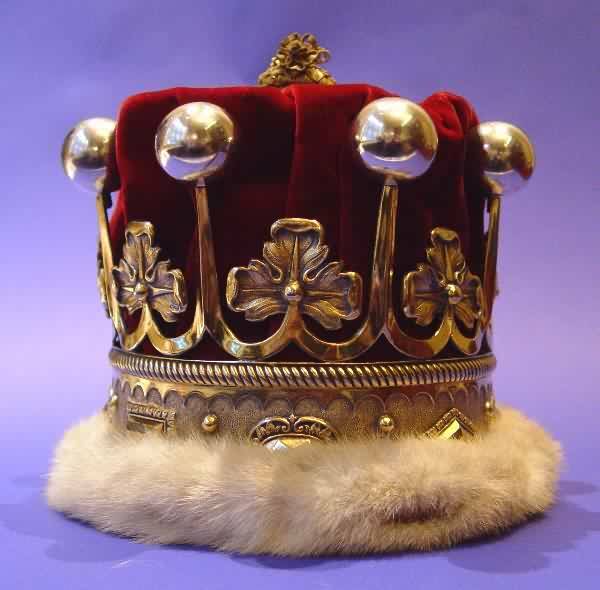 The coronet of a marchioness sits on top of the head (instead of around it). A marquess is a peer of the second degree in the peerage, ranking above an earl and below a duke. ADMIRAL LORD CHARLES WILLIAM DE LA POER BERESFORD, BARON BERESFORD, GCB, GCVO, was born in 1846 at Philipstown, County Offaly. He was the second son of John, 4th Marquess of Waterford, and brother of John, 5th Marquess. Lord Charles married, in 1878, Mina, daughter of Richard Gardner, in London. He was educated at Bayford School, and Mr Foster's School, Stubbington, Hampshire. His distinguished career is very well documented already. Admiral Beresford was elevated to the peerage, in 1916, as BARON BERESFORD, of Metemmeh and Curraghmore, County Waterford. Lord Beresford died three years later, in 1919, when the barony became extinct. He died at Langwell, Berriedale, Caithness, aged 73. After a State funeral at St Paul's Cathedral, Lord Beresford was buried at Putney Vale Cemetery in south London. Lord Beresford inherited the County Cavan estate of his relation, the Most Rev Lord John Beresford. The Most Reverend and Right Honourable Lord John George de la Poer Beresford (1773-1862), Lord Archbishop of Armagh and Primate of all Ireland, possessing great wealth, was known for his considerable largesse. His patronage extended largely to Trinity College, Dublin; to the College of Saint Columba; and he restored Armagh Cathedral, at a cost of £30,000. Furthermore, His Grace augmented the salaries of his clergy. The bust of this distinguished prelate stands in the private chapel at Curraghmore, County Waterford. He is interred in Armagh Cathedral. The Archbishop bequeathed his County Cavan estate to Lord Charles Beresford. Learmount Castle in County Londonderry, belonged to the same family through marriage. First published in May, 2013. Beresford arms courtesy of European Heraldry. JAMES BRUEN, said to have been of Tarvin, Cheshire, went to Ireland in Cromwell's Army and settled at Abbeyboyle, County Roscommon. He was administrator to his brother, Henry Bruen, of Dublin, in 1700. MOSES BRUEN, of Boyle, County Roscommon, purchased land and property in counties Carlow and Wexford from the Beaucamp, Grogan and Whaley families. Thereafter, the family settled at Oak Park, County Carlow, and Coolbawn, County Wexford. Bridget; Mary; Elinor Catherine; Margaret; Elizabeth. COLONEL HENRY BRUEN MP (1741-95), of Oak Park, removed, about 1775, to estates which he purchased in County Carlow. COLONEL HENRY BRUEN MP (1789-1852), of Oak Park, and Coolbawn, County Wexford, was sometime MP for County Carlow. He married, in 1822, Anne Wandesforde, daughter of Thomas Kavanagh MP, of Borris House, County Carlow, by Lady Elizabeth his wife, daughter of John, 17th Earl of Ormonde. Katherine Anne; Mary Susan; Elizabeth; Eleanor; Helen; Grace. GLADYS PATRICIA BREUN (1914-), of Oak Park, who wedded, in 1939, Mervyn Anthony Arthur Rudyerd Boyse, son of Major Henry Thomas Arthur Shapland Hunt Boyse. They had four sons. She lived in 1976 at Maryvale, Church Road, Ballybrack, County Dublin. 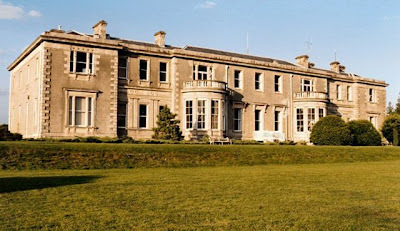 OAK PARK, near Carlow town, is a large Victorian classical house by W V Morrison. It has two storeys, the entrance front having a five-bay central block with a pedimented portico of four huge Ionic columns. The main block is prolonged by wings of the same height, initially set back though returning forwards with Wyatt windows at their ends. The garden front of thirteen bays is duller in appearance. The interior has splendid plasterwork in the style of Morrison; while the Hall boasts giant, free-standing Ionic columns. Part of the former Oak Park estate, once the home of the Bruen Family, from 1775 to 1957, is now the 127 acre Oak Park Forest Park. The Oak Park demesne was bought by Colonel Henry Bruen in 1775, after making his fortune in the American Army. He was the grandson of James Bruen, of Tarvin, Cheshire, who came to Ireland with Oliver Cromwell and received land at Abbeyboyle, County Roscommon. 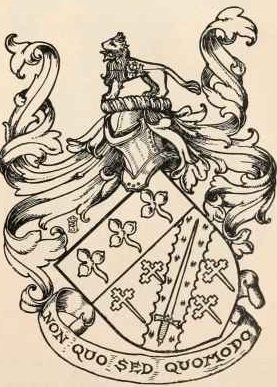 The Bruens intermarried with the County Mayo families, Knox of Rappa and Ruttledge of Bloomfield. HMS Drake, the wreck of which lies at Church Bay, Rathlin Island, was torpedoed in 1917. One of her Captains was Edward Bruen, son of the MP. He was Captain when the ship was flagship on the Australian station circa 1912/13. 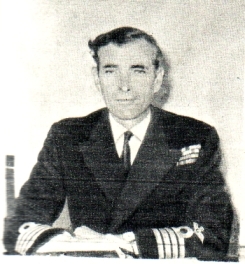 The Senior Naval Officer in Australia at the time was Admiral King-Hall (Admiral Sir George Fowler King-Hall KCB CVO) who had a very strong Ulster connection. Captain Edward Bruen RN was married to Olga Ker, one of the Montalto and Portavo family. 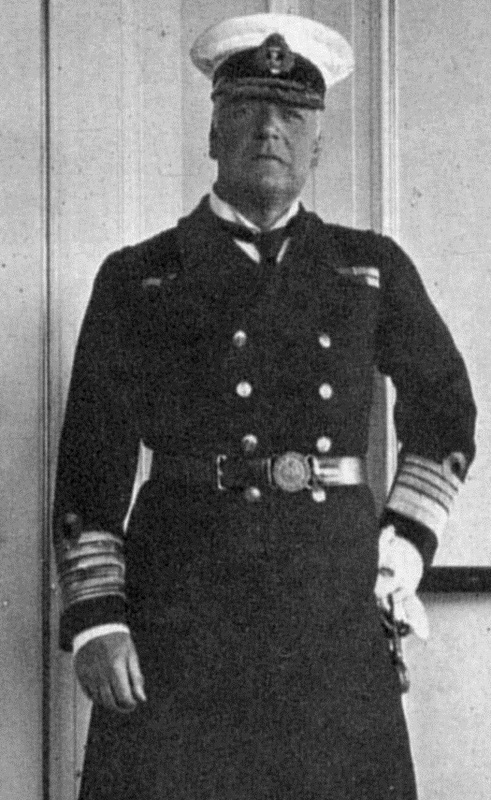 Captain Bruen later went on to command HMS Bellerophon at the Battle of Jutland. The Bruen estate was mainly in the counties of Carlow and Wexford where they had houses at Oakpark in Carlow and at Coolbawn, Enniscorthy. Francis Bruen was married to Catherine Anne Nugent, daughter of the Earl of Westmeath. 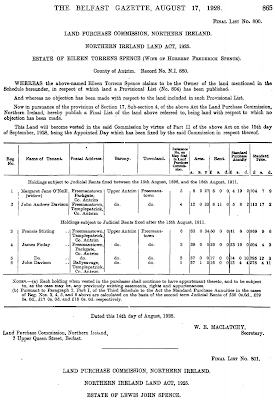 Three townlands in the barony of Athenry were offered for sale in the Landed Estates court in 1866. All this land gave the Bruen family political power and, in 1790, Henry Bruen was returned to Parliament, winning the seat of a neighbouring family, the Butlers. However, the Butlers reclaimed their seat five years later with the sudden death of the Colonel in December, 1795. This allowed his son, also called Henry, to assume control of the estate. The Bruen estate in County Galway amounted to over 700 acres in the 1870s but was part of an estate of almost 25,000 acres in total. Manuscripts in the Irish Genealogical Office would suggest that the family held lands at Boyle, County Roscommon, in the 18th century. These lands seem to have been at the centre of a legal case between the Bruen family and Richard St George. Henry Bruen attended Harrow School alongside the poet Lord Byron and Robert Peel, with whom he would later serve as a Conservative MP. Peel was Home Secretary at the time of Catholic Emancipation, a Bill which Henry Bruen supported. Bruen quickly amassed the land surrounding Oak Park. 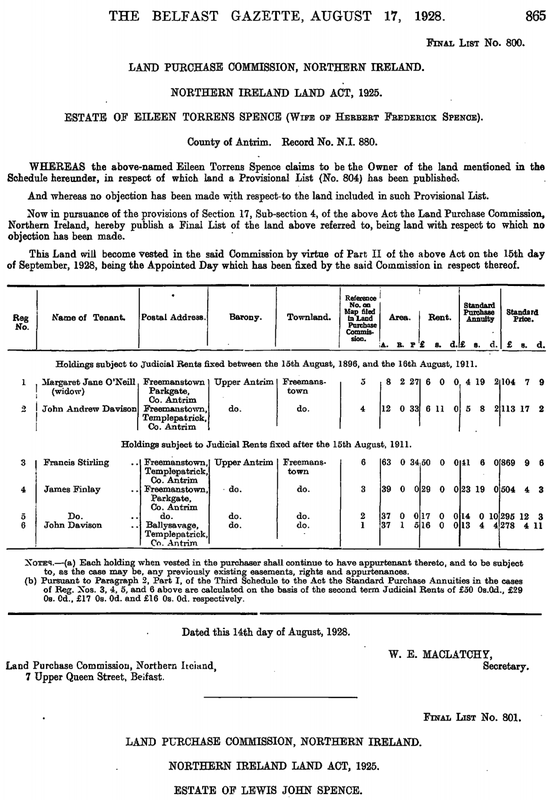 In 1841, a survey of every Bruen farm revealed that the family's estates in County Carlow covered 20,089 acres. In the 1841 election, Henry defeated the Liberal candidate, Daniel O'Connell, Jnr., son of “The Liberator”. However, the Bruen hold on the seat lapsed with the death of Henry in 1852; but his son, also confusingly called Henry, returned to the House of Commons in 1857 and held his seat until 1880, which marked the end of the family's 90-year history of political involvement over three generations. The current mansion house at Oak Park is the result of four periods of expansion and remodelling carried out between 1797 and 1902. Twenty-two years after he arrived, Henry employed Michael Boylan to redecorate the house. In 1832, the second Henry Bruen commissioned William Morrison to re-model the house and in 1876 Samuel Bolton, a builder, signed a contract for a major extension, which took three years to complete. However, on 22nd February, 1902, the house was gutted by fire. After eight hours of fighting the blaze, all that remained was the north wing. Fortunately, a large number of paintings, furniture and books were saved by the workers. The house was rebuilt under the supervision of William Mitchell. The last male Bruen, the fifth Henry, died in 1954. By then, the estate had reduced in size to a relatively small 1,500 acres. He left nothing to his estranged daughter Gladys, who had several years earlier married Prince Milo of Montenegro. The remainder of the estate was bequeathed to a cousin in England, minus a weekly income for life of £6 to his daughter, Patricia. In 1957, the estate was purchased at auction for £50,555 by Brownes Hill Estates, who already owned the nearby estate in which a Norfolk farmer was principal partner. However, within three years the property was back on the market after fierce protest from smaller farmers in opposition to the purchase by the Norfolk farmer. The estate was bought by the Irish Land Commission for £68,000, and seven hundred acres were divided up among small holders, while the house and the remaining land were taken over as a research centre for the Irish Agricultural Institute (Teagasc). The last member of the Bruen family to be buried in the family's private burial ground at the Mausoleum was Gladys, the estranged wife of Henry (d 1969). I am grateful to Henry Woods and Robert Power for most of the information; further reading about the Bruens and Oak Park can be read here. 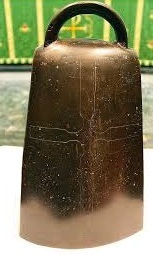 THE BELL of Bangor Abbey, County Down, dating from 825AD, was reputedly found at the Abbey ca 1780, and it is speculated that it had been hidden at the time of the Viking attacks on Irish monasteries. It was in private hands for some 150 years, and then housed in the Ulster Museum before coming to Bangor Borough Council in the 1950s. The cast-iron bronze bell would have been used to call the monks to prayer. THIS Bell was in the possession of Lieutenant-Colonel John McCance (1843-1922), of Knocknagoney House, near Holywood, County Down, whose great-grandfather found it in the ruins of the Abbey. "this bell was found in the ruins of the abbey about sixty years ago" (last decade of the 18th century) and was in 1853 in possession of Dr Stephenson, of Belfast." The Bell has been at North Down Museum, Bangor, since 1984. It shows the flowering of Irish Christian civilisation which was set back by the pagan Viking attacks. The bell would have been used to call the monks to prayer. THOMAS ARTHUR HOPE JP (1817-97), of 14 Airlie Gardens, Kensington, formerly of Stanton, Bebington, Cheshire, married, in 1839, Emily, youngest daughter of Christopher Hird Jones, of Liverpool, and had numerous issue. THE HOPES were a large, wealthy and well connected family of Liverpool bankers and landowners. Samuel Hope was a Liberal non-conformist, noted for his philanthropic work in the city. His son, Thomas Arthur Hope, and his wife, Emily Hird Jones, had thirteen children. The family owned land in Cheshire, Flintshire and County Tyrone. They lived in a succession of properties in Liverpool, the Wirral and London. 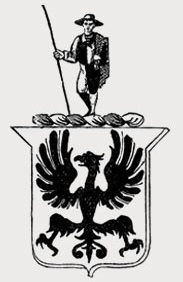 They are known to have associated with other prominent Liberal families including the Rathbones of Liverpool and the Gregs of Styal in Cheshire. The famous Hope Collection can be seen at the Lady Lever Art Gallery in Liverpool. The Hopes were wealthy bankers: Thomas Hope, born in 1769. The Rt Hon Sir Alexander James Beresford Hope was married to the Hon Louisa Beresford, daughter of William, 1st Lord Decies (3rd son of 1st Earl of Tyrone). First published in December, 2009. The coronet of a baron is a circlet of silver-gilt, bordered with ermine, with six balls (known as pearls) set at equal distances. 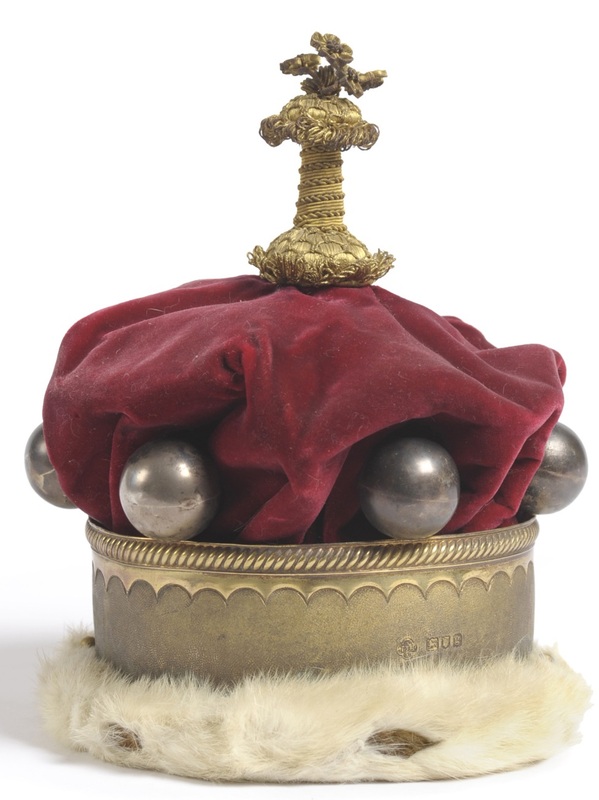 It has a crimson cap with a a gold-threaded tassel on top. The six large pearls distinguish the coronet of a baron (the lowest degree in the nobility) from the four other ranks of the peerage. Like all coronets, it is customarily worn at coronations, though a baron is entitled to bear his coronet of rank on his armorial bearings, above the shield. A smaller version, shown above, as worn by baronesses at coronations, sits on top of the head, rather than around it. CAPTAIN WILLIAM DARRYL OLPHERT KEMMIS MC (1892-1965), Inniskilling Dragoons. When Captain Kemmis died in 1965, Ballinacor was inherited by his maternal cousin, Lieutenant-Colonel Richard Lomer. BALLINACOR HOUSE, Rathdrum, County Wicklow, is a two-storey, late 18th century house, enlarged, re-faced and re-roofed in the 19th century. It has a three-bay entrance front with an Ionic portico. The end elevation has six bays, three of which are in a shallow, curved bow. There is a gabled office wing with an adjacent conservatory; an Italianate campanile at the junction of the main block and wing. The clock has been said to keep time for the surrounding countryside. The entrance hall is stone-flagged, with a plasterwork Victorian cornice; a large, top-lit, two-storey hall with oval lantern; oval gallery with iron balustrade. The demesne is said to be magnificent, with wooded hills topped by high mountains; a mile-long oak walk; and a mile-long avenue from the front gate to the house, bordered by rhododendrons and firs. There is a deer-park and the River Avonbeg flows by with abundant cascades and gorges. 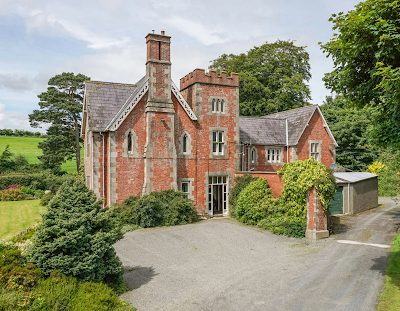 THE PRESENT owners, Sir Robert and Lady Davis-Goff, bought Ballinacor Estate in 2001 as a working farm and shoot. The house underwent an extensive renovation and modernisation project, which was completed in 2009. This renovation was sympathetic to the time in which the house was built and is furnished appropriately. The estate has a strong tradition of driven shooting and has game records going back well over a century. Grouse were previously shot on the estate, and it is hoped to revive the moor in future years. The coronet of the Prince of Wales, or, more properly, the demi-crown of the Heir Apparent to the throne is composed of a circle of gold; on the edge, four crosses patée, between as many fleurs-de-lis; from the two centre crosses, an arch, surmounted with a mound and cross, the whole richly chased and adorned with pearls; within the coronet, a crimson cap, lined with white sarsnet, and turned up with ermine. The original coronet of this design forms part of the crown jewels exhibited at the Tower of London. 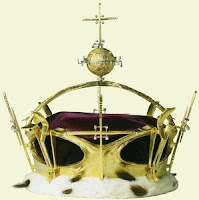 The royal coronet made for Frederick, Prince of Wales, in 1728, is a golden diadem, the band decorated with embossed jewel-like lozenges and ovals with foliate surrounds, on a matted ground, between rows of gold pearls. Above the band are four gold crosses-pattée and four fleurs-de-lis, partly matted and chased. The single arch dips deeply in the centre and supports a monde with gold pearls and a cross above, fitted with a purple velvet cap and ermine band. The Investiture Coronet of the present Prince of Wales was designed by the architect and goldsmith Louis Osman (1914-96) and given to HM The Queen by the Goldsmith’s Company for His Royal Highness's Investiture at Carnarvon Castle, 1969. 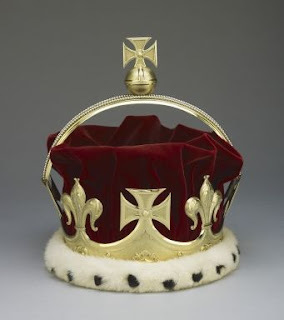 It is 24 carat gold, with four crosses-pattée and four fleur-de-Lys made from a nugget of Welsh gold, reinforced with platinum and decorated with diamonds and emeralds. 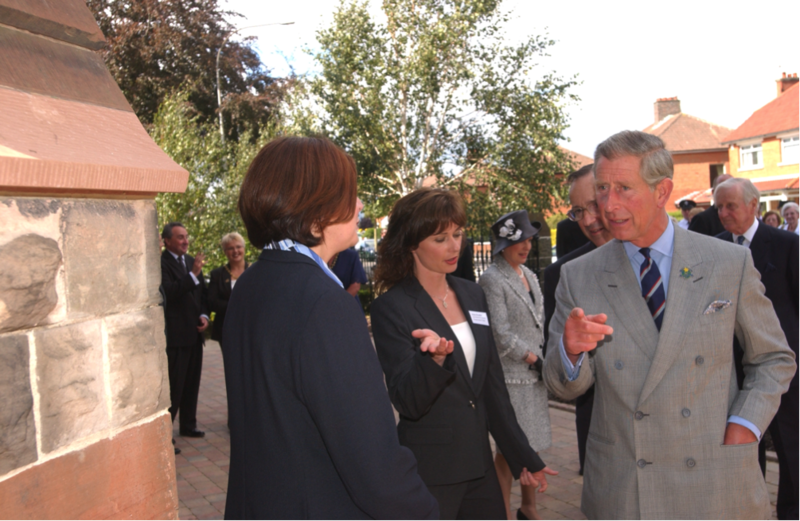 The orb mounted on the top of the arch was engraved by Malcolm Appleby with The Prince of Wales’s insignia. This is surrounded by thirteen diamonds arranged as the constellation of Scorpio, The Prince of Wales’s star sign. The diamonds set horizontally represent the seven Gifts of God on one side and the seven deadly sins on the other. BELMONT TOWER, as it is now known, is a two-storey five-bay former schoolhouse situated at the corner of Belmont Road and Belmont Church Road, Belfast. The building was constructed between 1889 and 1892. Before 1889, Belmont Primary School had been located in the grounds of Belmont Presbyterian Church, in a schoolhouse first opened in 1863. The school continued to meet at the church site for over 25 years until the erection of the present building. The architect of the new school was Vincent Craig (1869-1925), a local architect who was articled to W H Lynn between 1885-89, and who was the younger brother of the Rt Hon Sir James Craig Bt (the first Prime Minister of Northern Ireland). 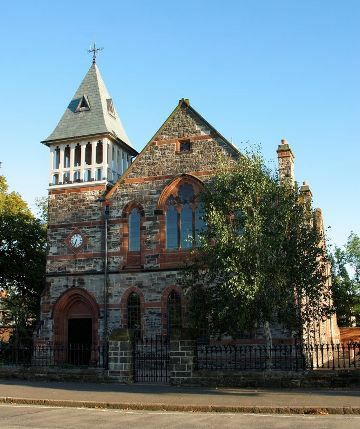 Belmont Primary School was built in the Gothic-Revival style, and locally quarried Scrabo sandstone was used in the masonry of the building with Locharbriggs sandstone as a secondary material. The construction of the school was undertaken by the local building firm of Dixon & Campbell. Belmont Primary School is said to have been erected in memory of Mrs Mary Ferguson, of Sydenham House. Robert Ferguson, of Sydenham House, Strandtown, was a prosperous merchant and businessman who co-owned Robertson, Ledlie, Ferguson and Company. The school was originally known as The Ferguson Memorial School and was administered under the state-managed National School System until after the partition of Ireland in 1922. The Belmont Tower website states that the old school was originally divided between its two storeys: the boy’s school occupied the ground floor; whilst the girls school utilised the upper floor of the building. The southern extension of the school was added in 1910 by a local architect, Thomas Houston (1873-1938). The Ferguson Memorial School continued to be administered by the National School System until partition. In 1926, the school came under the auspices of Belfast Corporation’s Education Committee, and consequently the school was renamed Belmont Public Elementary School. Belmont Public Elementary School was sold to the Belfast Education and Library Board in 1975 and was listed in the following year. 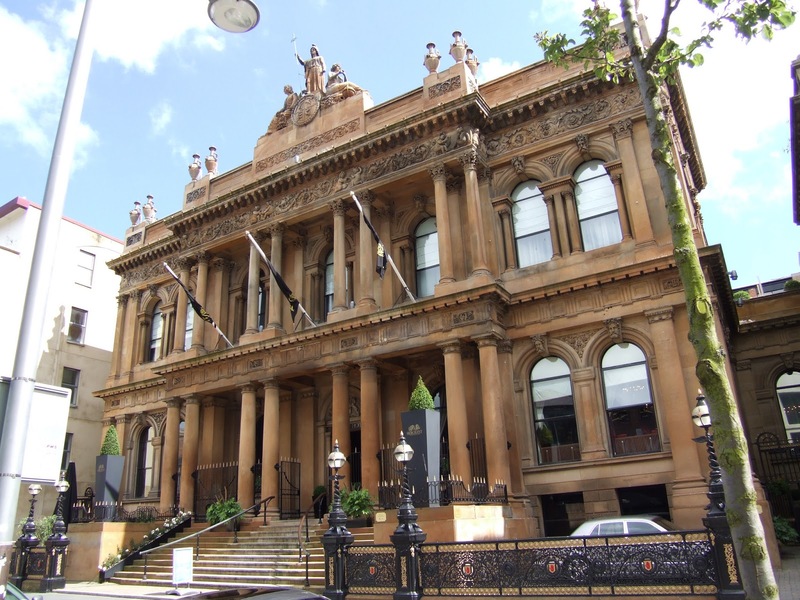 By 1994, the condition of the building had deteriorated to a point where Belfast City Council did not consider refurbishment to be economically viable, and the building was declared redundant in May, 1999. Staff and pupils moved to a brand new school that was built in the grounds. 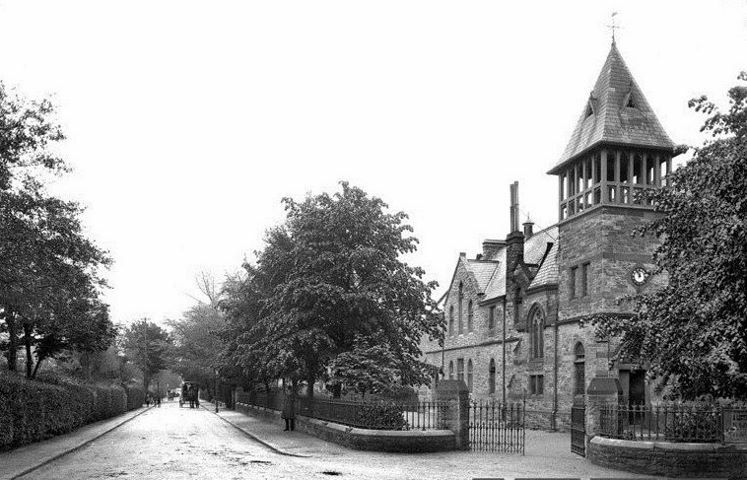 Nevertheless, local residents, many of whom were also parents of children at the school, were concerned for the future of the school building and established the Old Belmont School Preservation Trust in May, 2001. The National Trust subsequently acquired the building. Work began to restore the fabric and introduce 21st century facilities, for various community uses such as a pre-school play group, coffee shop, function and meeting rooms. Belmont Tower was officially opened by His Royal Highness The Prince of Wales in September, 2004. BELMONT TOWER, Belmont Road, Belfast, is today used for small conferences, seminars, "away days", staff assessment centres, training, exhibitions, product launches, breakfast, lunch and dinner meetings, business networking, board and committee meetings, and receptions. There is a café upstairs. This was my primary school in the 1960s: Miss McMinnis was the headmistress; and Miss Cartright - aka Cartyballs - zealously banged children's heads together when she felt so inclined. 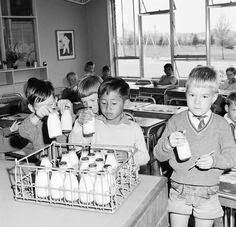 Little bottles of milk (1⁄3 of a pint, I think) were delivered in a metal crate for us every day.